We can supply a wide range of standard size pouches that are ideal for badge lanyards or name tags for conferences, seminars, events and exhibitions. If none of our standard pouches and card holders are suitable then we are able to make a custom sized pouch just for you - please ask our sales team for details and prices. Use the enquiry form on the right or call us on 0800 022 6483. We also supply rigid business card holders, click here for details. Note that dimensions shown are the card/insert sizes. 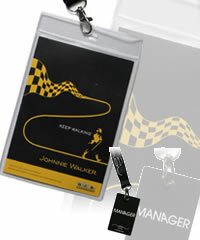 We can supply pouches or badge holders to your specific requirements. Whatever size you need, large or small, portrait or landscape orientation, we can supply you with lanyard pouches made to fit your needs exactly. Talk to our sales team about your lanyard pouch requirements to get a personalised quote. Use the slider to set the required quantity or you can enter it directly into the box above.